Sam's Drunk Dog wrote: I'm boycotting the game until the always-online requirement is removed. this, plus the $60 pricetag has me hesitant. Graphics look good, but that's awful steep for a game. And if I am out of wifi range, not able to play... would annoy the heck out of me. I have intel i3 with 2GB RAM, so it seems like I could play the game, but it says optimal is i5 with 4GB RAM, do you think I will be okay or will the gameplay be hurt badly? I assume just as the maps get more full it may have to pause to do some loading..
i don't think i could deal with the lag that my laptop would inevitably force me to sit through. I need my desktop. Fire0nice228 wrote: I have intel i3 with 2GB RAM, so it seems like I could play the game, but it says optimal is i5 with 4GB RAM, do you think I will be okay or will the gameplay be hurt badly? I assume just as the maps get more full it may have to pause to do some loading.. I'm running it on a core 2 duo, 4gb ram, and a 260GTX laptop. Decided to trash everything and rebuild my city last night. Made much better progress. Often times I'd run out of electricity and water, but I have it all fixed. I had a dream that I was playing sim city last night. Only thing is, i've never played one of those games, so it was completely made up based on my imaginings of what the game is like. You start to tinker with your existing city. Knock down buildings, increase the density of the roads, rezone, and so on. I want to add a regional airport, but do I need to knock down a huge industrial zone? Only time will tell. The size limitations are another huge negative for me with this game. Sam's Drunk Dog wrote: The size limitations are another huge negative for me with this game. Yeah, I'm a little dismayed with it as well, although it forces you to make tough decisions with the land you do have. 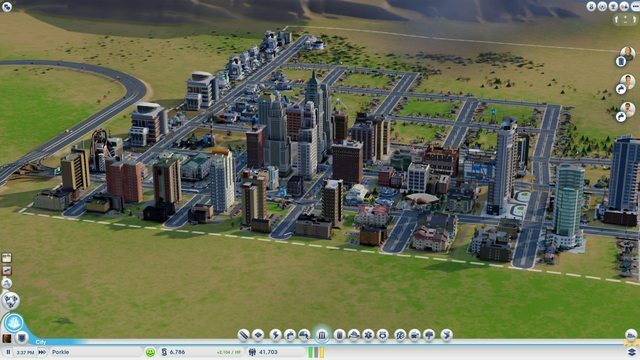 There will probably be an expansion pack for larger cities. The biggest thing is to share upgrades with your neighbors so they don't have to build them as well. I've started secondary cities on my own private games that are meant to support my metropolis. can i choose my neighbors? I'll be your neighbor. Ignore the smell. You could go after resources, check out what the ground underneath you is full of. I want to start putting together a great work and we will need a lot of resources for that. Someone needs to claim land with water. I run out constantly. Malkamaniac wrote: Someone needs to claim land with water. I run out constantly. Build your water pumps right beside your water treatment. Have you noticed any health problems with your populace from using that strategy? Sam's Drunk Dog wrote: Have you noticed any health problems with your populace from using that strategy? The treatment plant purifies the water. Just make sure under the water view that you are pulling from clean water. If the ground is already contaminated in that area, you are going to have issues. You will need to setup you waste treatment in an untainted spot somewhere else on the map if not. You can take a look at my city if you want to see what I'm doing. Just send me a friend request on Origin and I'll send you an invite to our region. Thanks. I was just curious. I'm still mulling over buying the game. I'm hoping that Maxis will address some of the complaints and release a new version or patch.